Little Giant Pumps dual purpose submersible and inline fountain and pond oil-filled pump 300 GPH # 2E-38N-WG (502375). Epoxy coated aluminum housing, 3/8" FNPT suction with snap off screen for easy cleaning, 1/4" MNPT outlet accepts 1/2" I.D. flexible tubing, 115 volts, 1 phase, 60 Hz, 1/40 HP, 100 watts, 1.7 amps, 15 ft. power cord, thermally protected oil-filled motor. 4-3/4" high, 5-1/2" long, 3-1/2" wide. 5.3 lbs. 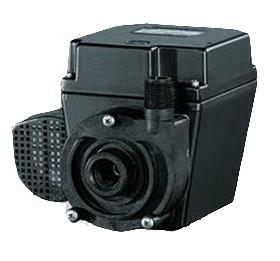 Little Giant fountain and pond, submersible and inline oil filled pump 500 GPH # 3E-12N-WG (503375). Dual purpose, operates in-line (not submersed) or submersed. 1/2" FNPT screened inlet; 1/2" MNPT outlet accepts 3/4" I.D. tubing; 115 volts, 1 phase, 60 Hz, 1/15 HP, 200 watts, 3.2 amps, 15 ft. cord, thermally protected, non-toxic dielectric oil filled motor. Dimensions: 5-1/2" high, 7" long, 4-1/2" wide. Weight: 8.8 lbs.